If you have a large yard you may want to consider purchasing an old piece of farm equipment. 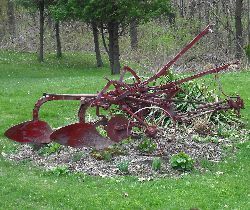 Displaying farm implements for decorative purposes is gaining in popularity and they often can be obtained for the price of scrap steel. Implements can be painted but it may be better to leave the machinery as is, rust and all, for that rustic look. Old cultivators have been a favoured for years but are hard to come by. Because of its relatively small size it is easy to find a place for it in most gardens. 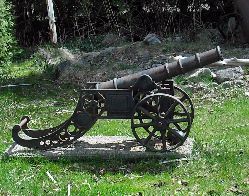 This cast iron field gun was one of a shipment of nine from Algiers, Africa to Canada. I was told by the owner that the gun was used during the war between the French Foreign Legion and Algerian independence fighters. However, there is no firing mechanism and by looking at the nozzle I doubt that the gun was ever operational! A nice story but even if it is just a story, the field gun looks good sitting there on the front lawn. 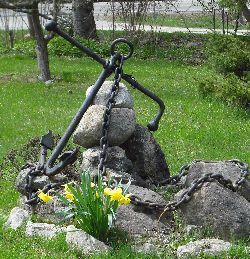 This ship anchor is artfully displayed. Unlike other decommissioned anchors, this one has still a length or chain attached to it. The chain is neatly draped on and around some rocks, resulting in an overall display that reflects peace and tranquillity. 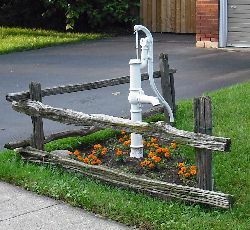 The old hand operated well pumps were once a familiar site but have been replaced by newer models or became obsolete once municipality supplied drinking water became available. A well pump will add that special touch to any garden setting. This old pump has stood guard for almost 40 years. The handle has been welded shut to prevent children from trying out the pump and ruining the plants in the process. Fire hydrants can be an beautiful addition to any backyard setting. Find out how to get your FREE fire hydrant. What is next, the kitchen sink? This unusual garden "decoration" was spotted in Nova Scotia. 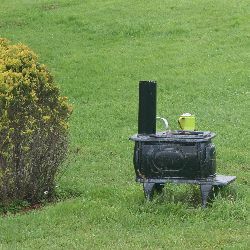 Actually, the stove has great potentials and could become the focus point of the garden. All it needs now is a person with a creative mind. 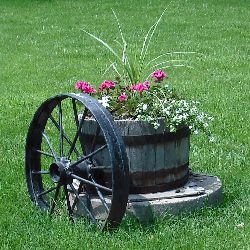 An old tractor wheel, a planter and some imagination was all it took to "hide" the old well.